Why is Branding a Compliance Program Effective? By Robert A. Wade, Esq. Effectiveness is the emphasis for healthcare compliance today. Sarbanes-Oxley and the proposed amendments to the U.S. Sentencing Guidelines emphasize that healthcare organizations need to create a culture of ethical and compliant behavior. In order to create an ethical culture, employees and physicians should receive consistent and repetitive messages noting the organization's emphasis on ethics and integrity. Ethical messages should be consistently communicated. Although issue-specific articles and targeted education are extremely important to create and ethical culture, these communication opportunities do not confront employees and physicians daily. Thus, the organization's emphasis on an ethical culture is limited if the message is contained in infrequent communication opportunities. Images or taglines, if presented to employees and physicians daily, help to reinforce an organization's emphasis on ethics and integrity. For example, what do you think of when you see the following images: the Golden Arches, a swoosh, or Snoopy? Obviously, these symbols stand for McDonalds, Nike, and Metropolitan Life Insurance, respectively. These images help to remind consumers about the products or services that stand behind the image. For healthcare compliance, if a constant image or message is before employees and physicians, and the organization stands behind the message or image with the hallmarks of an effective compliance program, the image or slogan will help to create an ethical culture because of the constant reminders. If the image or slogan is prominently featured on posters reminding employees and physicians of the reporting process, every time the employee or physician sees the image or slogan they will be reminded of the organization's ethical culture. The image or slogan itself will be the constant reminder regardless of the information that is included with the image or slogan. Why are images that promote a product or culture so important? The employees and physicians involved in healthcare today are from an image-rich culture. Images promote ideas, themes, products, etc. Our image-rich culture connects ideas and themes with images. So if a healthcare organization desires to reinforce an ethical culture, developing and promoting an image is a culturally relevant and effective tool. One effective example of an image that promotes an ethical culture is Captain Integrity. 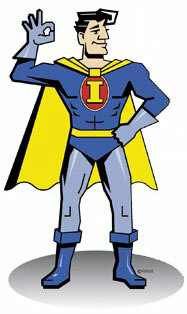 Captain Integrity has pictures that can be attached to an organization's compliance communications. Captain Integrity also has developed monthly picture strips that help to emphasize the organization's ethical culture, while providing educational training regarding compliance issues that face the healthcare industry. Captain Integrity is only one example of how to create an ethical culture by providing images that emphasize the organization's commitment to integrity and ethics. Developing and promoting an ethical identify for your organization, however, does not ensure an effective compliance program. Promoting the golden arches and Ronald McDonald, for example, does not ensure that McDonalds has the best hamburgers. The golden arches and Ronald McDonald are only one part of McDonald's overall business promotion. An image or slogan that reinforces an organization's emphasis on ethics and integrity only helps promote an organization's cultural beliefs. The other hallmarks of an effective compliance program must exist, including a high level compliance officer, auditing, policies and procedures that emphasize ethics, allocation of adequate resources to ensure ethical conduct, investigation and appropriate disciplinary actions for ethical violations, etc. Creating an image or slogan for a healthcare organization's compliance program is only one component of an overall effective compliance program.